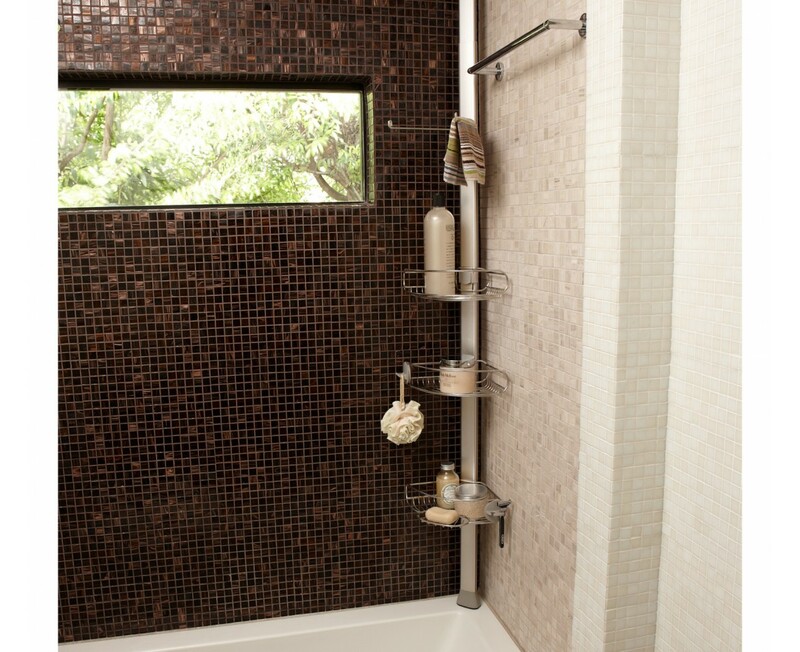 De-clutter your shower space! 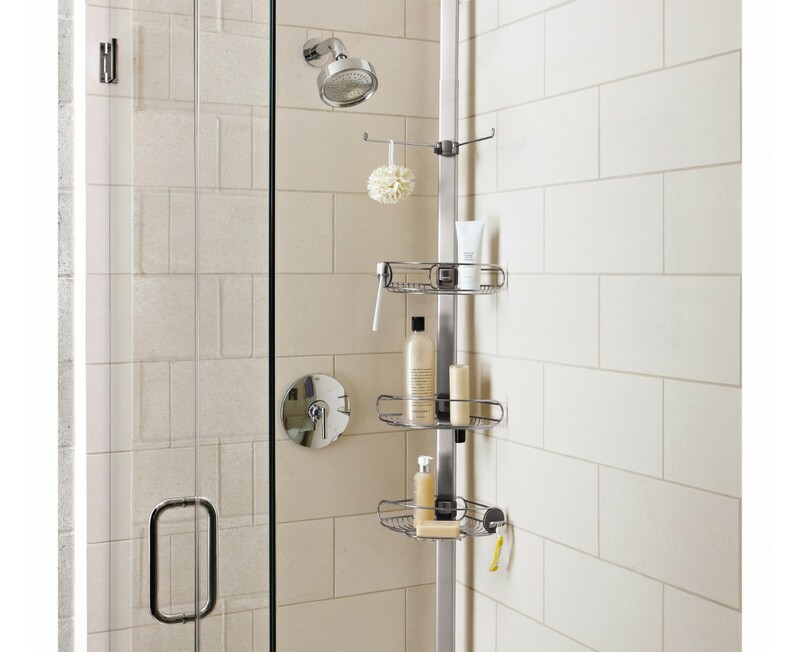 Our tension shower caddy provides a durable, space-efficient storage solution for virtually any shower or bath. Its reinforced aluminium pole with high-compression spring fits securely between your floor and ceiling, extending from 1.8m to 2.7m (6 to 9 feet). 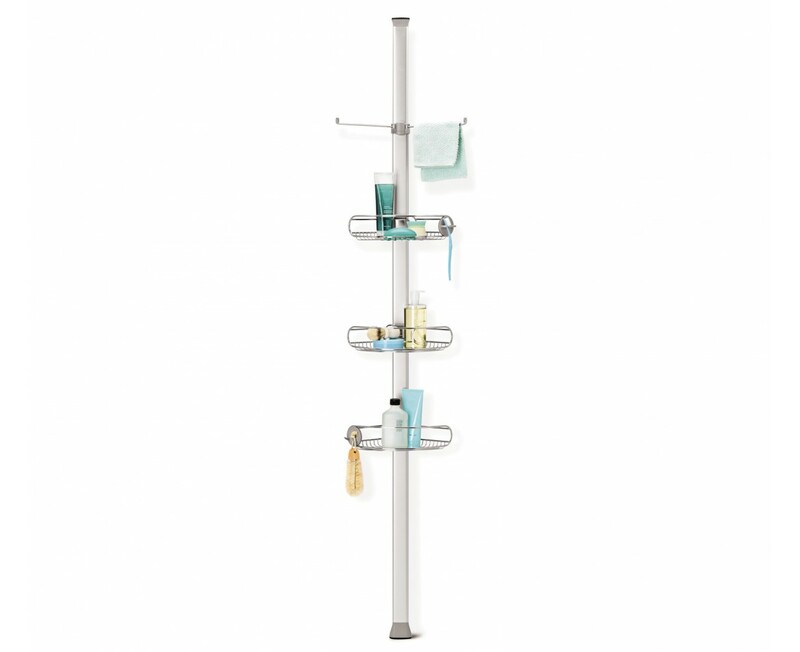 Three adjustable wire-frame shelves slide up and down the aluminium pole to hold all your shower essentials. Made from completely corrosion-resistant materials. Reinforced aluminium pole with high-compression spring and grippy rubber feet fits the caddy securely between your floor and ceiling. Secure tension pole extends from 1.8m to 2.7m to fit most showers and bathtubs. Adjustable wire-frame shelves slide up and down to make room for tall bottles. Special cut-out holes allow you to store bottles upside-down for quick dispensing. Hold a razor, loofah, toothbrush or other accessories. Durable stainless steel construction is corrosion-resistant and easy to clean. Bought a tension shower caddy a few days ago. Supposed to be rust proof & time will tell. It's very sturdy compared with another I have but at a much higher cost so that's expected. The shelves are spacious but not all bottles stand level on them as they are not completely flat.It has lots of useful accessories such as the small arms for holding a washcloth/towel and hooks for other items. There is also an attachment which holds a couple of toothbrushes or razors(allegedly). My ladies razor fits in here but my husband's, having a slightly wider neck, doesn't which is another irritant. He has to lay it flat on a shelf where it can get knocked off or fall through the gaps. A great buy and looks great! I did a lot of searching for different shower caddy's and this was the most expensive, BUT well worth that extra expense! The quality is superb and they have put a lot of thought into it's functionality and how it looks, and it looks expensive. Very easy to install. I would definitely recommend getting this above any others, especially as it's a long term purchase that you want to last. I've had other cheaper shower caddy's and they always end up looking rough after just a short while, I now feel I have something that will last and continue to look good. I had to contact customer service regarding delivery and the customer service is also 5 star. We have a walk-in shower in the en suite. Very modern and luxurious - but no shelves. I hated having all the products on the floor of the shower. I saw some tension rods on Amazon, but they looked really cheap and awful. This looks amazing and functions perfectly. Obviously it's expensive, but well worth it. Well worth every penny. Good quality, high standard finish. Looks good in the corner of the shower and does what it's suppose to do. So pleased with this shower caddy as it doesn't take up much space and looks good. Easy to clean. You get what you pay for....and this product is worth spending the extra money! This shower caddy is high-quality, easy to assemble, sturdy, attractive and provides plenty of storage capacity. Great investment....I highly recommend this purchase. Keeps everything uncluttered in my walk in shower. It doesn't wiggle around and shake while using the pump dispenser for my body wash. Easy to wipe down and keeps its finish. Very sturdy, worth the price. Produit de bonne facture et pratique d'utilisation. Simplicité au montage. On peut y ranger tous les produits de douche ainsi que 2 gants de toilette et 2 serviettes (famille de 4 personnes). Je suis très contente une fois de plus des produits simplehuman. I buy Simplehuman goods now as I know I get what I pay for. For each item I have purchased I know that I can find similar items half the price, but I also know I would be replacing them in super quick time as they are not made to last, NOT MUCH is made to last, so keep up the good work simplehuman ~ don't ever lower yourself to the normal standards. Thank you for your review, a customer support agent will be in contact with you shortly. Ou sont les produits ? D'une très grande qualité de finition et d'une simplicité d'utilisation et d'installation ! Nous sommes une famille de 5 personnes, quels gains de place et de temps !! Très pratique et une installation très simple. La qualité est au rdv !! I purchased this because I did not want to drill into tiles and have found that most other shower baskets tend to rust after a short while. I ordered direct from Simplehuman and delivery was very quick. The item was well packaged and the instructions were fairly easy to follow. Fitting within the shower itself was a little tricky but was completed quickly. I am pleased with the baskets and particularly the 'arms' for face cloths etc to hang from. All in all a positive experience and what appears to be a well made product. Does the job it's designed to do very well. Looks good in the corner of our walk in shower and is great value. A very well made product which fits perfectly into the shower. Does the job admirably and the extra trays cover all needs Well worth the xetra money over some similar products. I love how sturdy it is. But am skeptical on rust resistance. Time will tell. We have sulfur and well water and things don't last long. Thank you for your feedback. We stand behind our products, that's why your shower caddy carries a 5 year warranty. Feel free to call us at 877-988-7770 8am-5pm PST M-F should you ever need help with any of our products! This shower caddy was easy to put together and looks very good. It does the job intended excellently. Easy to assemble & fit. I also found the shelves leant forward but with a bit of fine tuning they now seem level.I would prefer the tray with the soap dish to have the rails a bit closer together so I can put my spectacles on then without the risk of slipping through. Overall a very good product. I really love this product i have had it for a month or so and it works out very nice in my shower tension keeps it exactly where i put it. I would recommend it to anyone who is looking for a nice shower caddy. We've just had our ensuite refurbished and with an enlarged shower area it was a no brainer to buy another one (we have one installed in a second bathroom too). Yes it appears expensive but you do get what you pay for in terms of quality and ease of use. Thoroughly recommended. In theory this is a very good product though I feel it could be improved even further yet. The improvements I'd like to see are: 1. the face cloth hanger needs a spacer to fit properly onto the smaller main stem; it fits perfectly on the larger one but is loose when on the smaller one. 2. The baskets/trays are too light weight and need extra strengthening rails. The most rigid is the one with the soap tray as there are fewer of the flexible rails. 3. As other reviewers have pointed out, it is difficult to get the baskets/trays level, they lean downwards and short of easing the main stem forward at the bottom and out of vertical it isn't possible to get them level, consequently bottles etc slide to the front and so exacerbate the problem. 4. In my opinion the instructions ask you to assemble the caddy upside down. I would prefer to have the bigger main stem at the top and the smaller one at the bottom, this would sort out the face cloth hanger issue and prevent the risk of water ingress from the smaller stem into the larger one. There again perhaps I've assembled it upside down? Small points but for me these take the edge of the 5 stars. Thank you for your comments and suggestions, we have passed these on to our research and development team who are always keen to hear customer feedback. Rust-proof, brilliant product, and is very sturdy. Very happy and satisfied. A bit expensive, but I guess much better that what's available in the market today. Although a little pricey this shower caddy is amazing. The quality of the materials is excellent. It is easy to fit, has lots of storage space and the shelves are moveable for those big shampoo bottles. Very stylish and everyone who has seen my new bathroom has asked about it. This is the best floor to ceiling caddy we have ever purchased. The trim matches our anodized aluminum shower door trim perfectly. Very nice product. this is a perfect example of -"you get what you pay for". its more expensive than similar products in the market, but well worth it. we now have two caddies. Great product, lots of shelf space, sits unobtrusively in the corner and looks fab. Very pleased with our purchase. Was going to give a 4 star, but gave a 5 because the customer service was great! When I got the unit had a piece that was loose in the box. I called the customer service they asked of a picture of the piece and they responded quickly and explained where it came from and I was able to place the loose piece where it belonged. The unit is great but think it is a little expensive. ( that's why I was going to give a 4). But you have to give it to them. The unit is very well made! We have a 9 ft ceiling and this is the only product that can reach without bowing in the middle. It is well constructed and easy to set up. I LOVE IT! I've had it for 6 months and it has not rusted. It is strong and study and looks great. Simple Human Rocks! I bought this shower caddy as a gift for my design-conscious partner who has put it in his en-suite bathroom where the quality of the caddy's finish perfectly matches his top-end fittings. It is totally robust and I am confident it will not shift or topple even when filled with bathroom products. It's a bit more expensive than other shower caddies on the market but the quality and durability more than compensate for that. This shower caddy is a piece of artwork to look at the feel is like satin as the stainless steel is very good quality, so smooth with no scratchy bad finishes unlike many other shower accessories on sale. It is good to buy add on`s to suit your personal needs too what a great idea! Yes a bit costly but will probably last a lifetime! Clean smooth attractively modern. Thank you Superhuman, I look forward to placing further orders for their quality items. I love this shower caddy. I had purchased another brand a couple of years ago and it was a rusted mess in short time.The style of this is quite nice. Plenty of space for multiple bottles, shaver, brushes, cloths and soap! I like that I can change the height of the baskets easily. It's a winner in my book! I have been using your stainless steel butterfly trash cans for many years too! Can't say enough GREAT things about those either. I will never purchase another brand! I have purchased two of these and love both of them. One was for a small shower in an older home and it's absolutely perfect for making that shower functional. And the other was for a bathtub shower and it is wonderful. This is the most versatile shower caddy that I have seen. I love that the baskets are adjustable. I love this caddy! I replaced one I bought about a year or so ago that was already rusting. Am pretty sure this one will last a lot longer! I am extremely satisfied with my simple human shower caddy. So satisfied, in fact, that I bought a 2nd one for my other bathroom. It was easy to put together, though the spring for the first one was in the box, which stumped me for a while, since it is supposed to be in the tube of the shower caddy. I haven't had it long enough to confirm that it won't rust (just a few months), but so far it is looking very promising. It is considerably more expensive than others, but it is worth it! I give it 5 out of 5 stars. It's great. You will not need any other piece in the shower it holds everything. It's clean attractive piece in the shower. I just moved in with my very tall boyfriend. He brought his slightly rusted, over the top of the shower head caddy from his last place. It was a) gross and b) not enough space for both of our shower items. I purchased this item as a solution and we couldn't be happier. Installation was straightforward, we worked together to get it situated in the corner (the spring is strong so it took two of us). With the adjustable shelves, we fit everything neatly and easily t for our respective heights. Buy this! Toss the cheap and make the leap! After years of purchasing and re-purchasing floor-to-ceiling or tub-to-ceiling shower caddies from Target, I decided to make the leap and purchase this model from Simple Human. Although the Target ones are half the price, they rust within a year or two (depending on shower size/shape & how much water hits it) and need replacing. I have owned 4 from Target so have essentially purchased the equivalent of 2 from Simple Human......i.e. I should have purchased from SH from the get go! Because of the thickness of the pole, it's very sturdy so you can trust it won't come crashing down. The baskets are adjustable without disassembling the whole thing, which is really nice. The only thing is that I wish they were a little easier to move up and down like SH's Adjustable Shower Caddy that fits over the shower head. Readjusting the shelves on this is really a two-person job - someone needs to hold the pole in place and the other person needs to push or pull really hard to move them. But once they're in place, you know they're not going anywhere! 2-year warranty is also a bonus, but with all my other SH products I know it will last many years to come. Thank you for your feedback. We're glad to hear that you've decided to make the leap and purchase the tension shower caddy! Your product actually carries a 5 year warranty and should you experience any problems, please feel free to contact our friendly support team at 877-988-7770 M-F 8am-5pm PST to assist you. This is an excellent product. Easily fitted. I was concerned that the baskets might be a bit small but they are a good size and hold every thing comfortably. Its expensive but all other similar things that I have had have been chrome and eventually rusted. I'm assuming that this one won't. Excellent product, looks great, in use daily. Highly recommend. It looks amazing. Love the colour and the style. Pure class. I use it in both of my bathrooms and my wife loves it. It looks elegant and we are happy with the purchase. After seeing a plastic version of this (at my parents place) buckling under the weight of large shampoo bottles, I decided a strong, metal structure that wouldn't rust was want I needed. This shower caddy is just the ticket. It's great and fits on the edge of my bathtub perfectly. The minimum height required was just enough (only 2cm to spare) and I now have a tidy shower area. I buy large, heavy bottles of shampoo & conditioner and they are all easily supported. The shelf units can be adjusted to the required height and have a metal grill for the base, so water drains through, leaving my bottles dry after 20 mins or so. This is a stylish, durable caddy - although it's expensive, it's worth the money. I don't think I'll have to buy a new one for years to come. This is the 2nd shower caddy I have bought, I loved the first one so much. Everything about is just perfect. It fits in the shower great. Every thing about it is quality, practicality, and ergonomically pleasing. The caddy is solid and well made. It works well in the shower and also looks good. Assembly and installation was relatively easy, though it required more force (eg, strength) than I expected. I would not expect my 65-year-old mother to be able to assemble this thing. One shortcoming is that the baskets (eg, the wire containers holding your bottles) do not seem to hit 90 degrees, so the bottles sometimes lean or fall over if not arranged carefully. I've resorted to leaning the entire tension unit at a slight angle to help, but it's not perfect. This does not affect usage enormously, it's just annoying. I got tired of the crap that the wife was bringing home from the 'De_pots' and wanted to find a product that would last a lifetime. The shower caddy is the one! The product is great, but for what you pay for it, it had better be GREAT! After spending several hours with a hacksaw on the junk sold in the local big box HW junk store, i spent an hour looking for a product and this is what I found. While sold for as low as $79 on sale, it was not my luck to find it on sale. I figured my time was more important than the price, so I bought and am well pleased. It went up without a hitch and is sturdy and capable of handling any of my 3 kids swinging on it while performing acrobatics in the slippery tub. The only NEGATIVE i will give, and for me, it is a big one, SimpleHuman shipping, customer service and management really STINK at supporting their customers questions and are not responsive in any fashion. I will NEVER deal with them again, but will find another resource such as Bed Bath and Beyond, Wal-Mart, or other REPUTABLE vendor to deal with. I could have gone to BBB and picked one up, but thought i would receive better support by going direct, WRONG ANSWER! Took a horribly long time to ship and then no one would respond to my numerous inquiries for order status. They finally responded AFTER the item was shipped! HORRIBLE! Would i buy another one? YOU BET! In a MINUTE, but next time, i will find it ON SALE! Hello Scott. We're glad the shower caddy is working out for you and appreciate the feedback. We ship within 24 hours and UPS standard delivery could take 5-7 business days. As a side note for future orders, you may select an expedited shipping option should you need the product sooner than what standard shipping offers. The shower caddy is easy to instal, it looks good and is very functional. The good thing is that it won't rust. Other shower units I have tried always rust eventually but this one is all aluminium. It's quite expensive but you get what you pay for. A great product. Extremely pleased with my purchase. The caddy stores everything you would need in the shower, plus is looks very smart and worth the money. It took three attempts to get this, first time it arrived pieces were missing, second time,again vital pieces missing and there was a difference in colour of the main rods. The customer service though was spot on and thankfully we got it resolved. It is a great piece of kit, I would advise measuring the space beforehand as it is big, the baskets are substantial enough to hold lots of bottles of lotions and potions. Good and sturdy doesn't move once positioned. I love it! This caddy was bought to replace an old, cheap, white enamel and plastic caddy that was rusty, and actually had never ben very good at holding things. The Simple Human Tension Shower Caddy is a much more substantial affair, made entirely from stainless steel and chrome-plated wire, and is much stronger and more useful. The shelves are horizontal, rather than leaning downwards, and they are more thoughtfully designed. The spring-loaded section which makes it fit between shower tray and ceiling is a good cross-section shape (not just a round tube), and very strong, but fitting it is easy enough. We are very well pleased with this - it wasn't cheap, but you really do get what you pay for - it looks much better and works much better than what it replaced. After buying 3 shower caddies over the last year, & each one going to the tip because of rust I cannot begin to reccomend this one highly enough. Fixing it was no problem, delivery excellent. I t looks great in the shower cubicle. I intend buying another one for our en suite. Just perfect. And no screws, so it can be moved for cleaning purposes or transferred to another part of the bathroom with ease. Excellent design. This caddy is just as described- easily put together and seems to be very sturdy and so far- oxidation free. We have lots of stuff on ours and would benefit from 1 more shelf as it comes with 3 + a hanger. It's clean lines and beautiful finish make this a perfect buy. I highly recommend it!! A must have. Great shower caddy. Its very well made but if it came with a bit more instructions, a bit cheaper and well packaged then that will be simply awesome. In simple it will be rates as 5 stars! Easy to set up,looks great!even fits the largest of shampoos!pleased the whole family we all have a shelf each. I purchased this solely because I am tired of buying the kind from the big box stores that rust out in a couple of years. Now, it's only been a few months but I'm going forward with the hope that the rust-proof claim is true. Now that it's installed I'm loving the easily adjustable shelves and that all the components are useful and serve good purposes. We don't use little shampoo bottles that can be turned over into the little hole provided when they run low, but the idea is genius and for us, serves as a place to set the shower squeegee. So far, so good! Gained another 2sq feet in the shower! Easy to assemble. Well designed, easy to assemble, performs exactly as it should, convenient, and makes organizing the shower simple! This product is well made. If you are looking for quality this is the right product to buy. Thank you. We needed a shower caddy. Although not the cheapest it is arguably the best value. It was easy to construct and put in place. Six months down the line we are going to get another for the kids shower. Good product. We recommend it to you. Very pleased with the purchase. Looks nice and very functional as well. Fits really good to my high ceilings. The shower caddy is well made with a sturdy aluminum pole and heavy duty stainless steel baskets. One minor install problem - a small retainer screw in the long extension prevents it from sliding into the pole. I simply removed the screw. Great design, fantastically functional, sleek, modern and easy to assemble. My father ordered one as soon as he saw the photo I sent him of my proudly assembled shower caddy! My wife normally makes fun of my purchases that she did not ask for. NOT this time. She loved it. Very handy, gives more room in older showers. Very easy to intall. 5 min or less. spent the extra money on this caddy hoping it holds up against rusting longer then the cheaper ones at department stores. had to cut the one piece with a hacksaw to fit from our tub to ceiling. Have only had for a month but so far very pleased with appearance and sturdiness. Well made and perfect product for the space. Bought 6 already and love them all!! Product is well made and pleasing to the eye. Well designed and very functional! Solid rustproof shower caddy which has 3 shelves that can be moved to whatever position that suits. It's also got wee hooks for hanging bits and bobs - I love it. I also found that you were as cheap to buy straight from the simplehumam website as they don't have a delivery charge when you spend over £49.00. My only criticism is that I wanted to position it on a raised shelf to the ceiling, and it was too long. I should have measured it first! Simplehuman should maybe have one a bit shorter and a wee bit cheaper!! Bought product for son in new apartment in California. Found item to be extremely easy to set up. Height was perfect. Very happy with my choice which makes me happy!!! I have had many shower caddys over the years. This will probably be my last. THis is sturdy, easily adjustable and easy to clean. WHat a great product! High quality item that I am very satisfied with. Def spend the extra money to buy the best product on the market. It is neat and simple but too many trays. I only need one tray if I can return the other 2 trays that would be perfect. So I don't waste precious material on earth. My two main complaints are 1) the shelf wiring is wimpy, causing containers to slide to the edge (and topple if tall enough) rather than having a flat stable surface to sit on; I think SH needs to consider using heavier weight metal or to run a supportive thicker rod under the center of the shelf wires (the shelf with the soap dish, for example, is very sturdy. 2) having the pole units come together with the open end facing up rather than down will allow condensation to drip down into the main pole; this will be a haven for mold long-term and not something you can get to to clean/dry out. The top part needs to slide over the bottom/main pole for future designing of it. We had struggled for a long time with shampoo bottles and soap dishes on a shelf in our shower stall. This show caddy has helped us clean up our act! Fits well, is sturdy and a great balance of shelf space. It was too tall for my space, until I figured out how to unscrew something and put 2 different parts together that might not normally go together...that's the only reason I give it 4 instead of 5 stars...I spent the first week worried it might suddenly collapse or something. If what I did is the norm, or possible, then they should add it to the directions. The only other option I had was to return it, and it was such a hassle to be home to sign for it from UPS. They won't leave it even if you sign off on it, because SH ships it with signature required. This is the best bathroom shelving unit I have ever purchased. It fits perfectly, very sturdy and keeps my bathroom very neat and organized. I would recomment this to anyone. Amazing and is well worth the money. We had a tile shower stall done in our new home; however, we did not plan appropriately for cut-outs for soap and other essentials. As a solution, we found and installed this product. WOW! It looks great and modern in our new shower. It is very sturdy, wire racks prevent build-up of "gunk", and keeps everything we need at hand. If we had it to do all over again, we would keep the clean lines of the new tile with no breaks or soap dishes, and buy this to install once again. So effective. So worth the money. very sleek new shower and I didn't want to mess it up with tacky shower stuff. This is very good looking, efficient and worthy of my beautiful new shower. 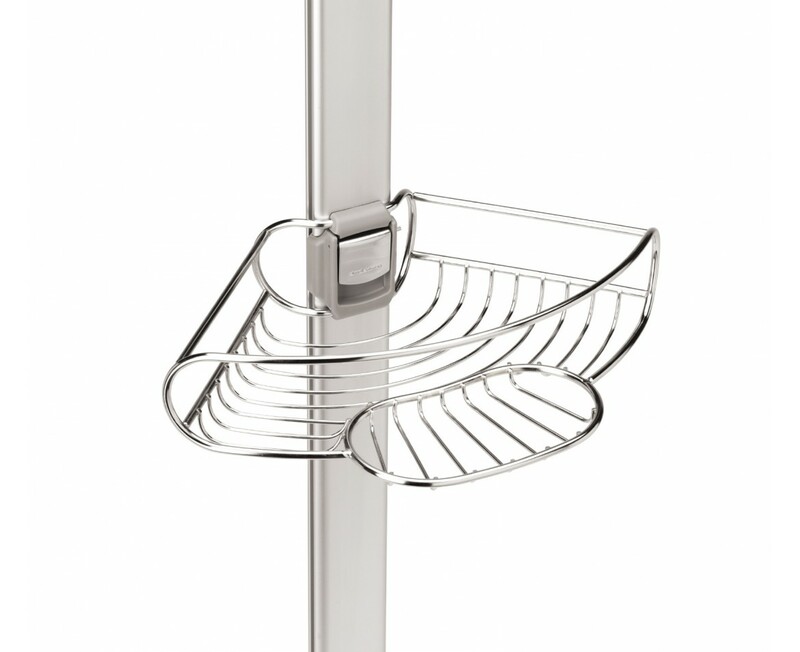 Was fed up of shower caddy's rusting - this is ideal, 5 year guarantee and looks neat. Has hanging space for shower scrubs so there aired after each use! Very easy to install and would fit any shower or bath as we didn't need to use full pole length. We tried another tension-pole shower caddy before this one, but the tension was too weak and the pole wouldn't stay in place. This one is not only attractive, matching the stainless steel fixtures in our bathroom, it's also strong and sturdy enough to stay put. We've only had it for a couple weeks but so far it's rust-free. After ridding myself of the rusty ol' pole caddy I started shopping for a new one. Plastic looks so tacky and my shower head is not designed for caddy. The over the door ones I feel ruins the solid glass doors of my shower. i found some reviews on this one and bit the bullet. It is well made but do put some liquid soap on to help slide shelves on or they can leave marks on finish. also they tape the locking mechanism on the shelf for shipping purposes and it should be removed. It appears we will not have a problem with rust and the shelves are roomy, sturdy, and I am very pleased with the product. High quality construction. shelves hold a lot of shower needs. Adds to decor of bathroom. Had minor problem with height of ceiling, only 70 inches. Cut longer extension to get a tighter fit, worked fine. After trying several poles over the years and having them all rust (some stainless) or corrode in 2-8 months, this one is solid and built to endure. Very easy to assemble and install. One small gripe - the hook tier is quite useless - hooks too long and with too much of a lip bend to fit most brushes etc. - and who keeps two face cloths in the shower these days? Service from SH direct was great - look no further if you need a shower pole. Easy to install, good dimensions, plenty of storage space. Worth the price. Easy to put together, and works perfectly. In love with this Shower Caddy. Checked out plenty of others, and this has the best features by far. Love the soap dish, the three levels and wash cloth and buff puff holders. I have more haircare products than a hairsalon. And they all fit.. even the professional jumbo size shampoos and conditioners. Love taking a shower, just to admire my brilliant purchase. I start every morning thinking "oh, what good taste I have." I like that the shower caddy has adjustable shelves and looks so elegant. The quality of this shower caddy is excellent and the tension spring give the right amount of force to keep it upright even at full extension. It fits neatly into the corner of the shower cubicle and offers loads of storage options i.e razor and toothbrush holder and flexible shelf positions. Easy to assemble -- put together in a few minutes -- and easy to install. Appears to be well-constructed and well-designed. Like the simplicity of the design and its sturdy, but streamlined construction. We have not had it that long, so cannot comment on durability. Like that the baskets can be adjusted in height and placed in any order desired. Plenty of room for all shower needs! Great shower caddy - a solid triangular shaped rod that holds it upright - I don't think I'll ever have to buy another one. Considering there are three of us sharing one bathroom, this caddy really helps keep things organized. We have space for all of our bath accessories and products, without piling things up. I like the fact that it is water resistant and will last. My old caddy rusted and never stayed in exactly in place - and it wasn't a cheap one. The Simple Human caddy stays where I put and is so far completely rust-free. It feels much sturdier than the others I've seen. It's worth the money. I bought s shower caddy for myself because I did not want to drill into my new tiled shower cubicle walls. This caddy is perfect - easy to instal, robustly made and it does everything I need. It is so good that I have just bought 3 more for another property I have refurbished for a client. So pleased Lakeland are now stocking Simple Human products as well. The shower caddy is sleek looking, sturdy and has a place for everysingle little thing that you could psossibly use while taking a shower....or bath...and the best thing? Easy assembly and easy install. Except for the base (hard plastic) foot that had to be modified to allow the caddy to be installed in my new shower stall (I had to make a silicone wedge) I love the construction, ease of installation and materials. I use it every day and it holds everything I need it to. We've had many, many shower caddies and they all ended up looking worn out and rusty. This is the nicest one we've ever purchased and is so sturdy and nice. It was a bit pricey but I think will be well worth the price. Love it! Having bought two other caddys in the past for a quarter of the price and been extremely disappointed,(they both went rusty within a couple of months), We were looking to buy a high quality one this time. The first thing we noticed was how well and robustly it was made, no thin spindly pole here - but an oval shape giving it much more rigidity and with a very powerful spring tensioning mechanism. There is no doubt in my mind that this is the best buy on the market. Yes it is an expensive caddy but it should last more than four times the cost of the other cheaper ones. It is used twice a day by my wife and myself, and so far we are very happy with it. If like us you have bought the cheaper versions previously and been disappointed, then buy this one - you will not regret it. the tension shower caddy fits well in an awkward shape en-suite shower with sloping ceiling and has good flexible storage. one of the baskets was damaged on arrival but simplehuman customer services sent a replacement promptly and without any hassle, so i would recommend this product without hesitation. I love my shower caddy and what other caddy will actually get you compliments from guests? Here's a tip for those who have assembly problems - a light coat of mineral oil applied to the bar makes the trays slide on with no scratching. One of the best shower caddies I have ever used (And I've owned a few of them) Especially like the soap dish, the washcloth hangers, the holes for putting shampoo bottles in upside down. Only downside is that it isn't quite short enough for 6 foot high showers, but I was able to macgyver it to work. We bought the shower caddy because it was rust free, stylish and designed perfectly - it holds everything we use in the shower. We liked it so much we purchased a second one for the guest bathroom shower. Easy to put together. Love the fact that it will never rust, like the one I was replacing. Solid construction and quality materials. Nice work. After several unsuitable other products, the latest of which went very rusty, this one is easy to put together and install, looks good and I anticipate will last a very long time. This is a lovely piece of equipment and compliments the corner of my bathroom beautifully. It is very well made, strong and sturdy and I love the clips that keep the shelves firmly in place and another positive note it also comes with additional top and bottom extensions, ideal to fit from floor to ceiling. Definitely has the WOW factor. Having had several cheaper shower caddies over the years all of which collapsed decided to splash out on quality and what a difference!! Beautifully designed and constructed. Highly recommended. These shower shelves were easy to install and they stay put. No shifting or slipping like a cheaper version I purchased before this one. I'm very pleased with this purchase. This was exactly what I was looking for. I had purchase a cheaper brand and in a week I started to notice it was rusting. After several months, it was a disaster. So I started searching the web and came across the simple human web-site. I found the shower caddy and was not sure I wanted to spend that much money. But I decided I would and I am very happy I did. The product is well designed and best off all no rust. The three shelves give you a lot of room to hold stuff. There is enough room to put at least two people's stuff on it. I know it is expensive, but it is worth it. I wasn't sure whether to get this or not, as it seemed very expensive for a shower caddy. However, having spent loads of money on cheaper products that rusted after a few months, I'm now pleased to have finally found one that doesn't. It looks nice, and is of good sturdy construction, and was easy to assemble. Am really pleased with this shower caddy and highly recommend it. I love how it reduces clutter and looks good doing it. I've only had this caddy in my shower for two months but I am absolutely confident it will never rust. The materials are first rate as promised and there isn't any "protective" paint to scratch off. This product just works, fits, and looks great. Spend the money, save yourself the headaches. Glad to hear you like the product! The baskets and towel hanger are not designed to lock onto the thinner extension poles, so they will not be as secure. shower caddy does what it says on the tin. I was reluctant to purchase after reading a few reviews about scratching caused by sliding the shelves in place along the upright. Everything went together without any scratching and it is well made and solid. This is the answer to our prayers! We have looked for a rust-proof, good looking shower caddy for years and had some disasters. Easy to construct, lots of space for all our stuff and more, we cannot reccommend this more highly. I searched and searched for a good quality prodcut, and this was the only one I could find. It is well made and looks super. Beautiful looking and functional, the simplehuman vertical tension shower caddy solves the problem of dealing with multiple bottles of shampoo etc. in an older bathroom with little storage. After having several large bottles of the wife's shampoos and conditioners fall on my toes (black and blue for a week!) and having the pump spouts break off, I decided to get serious about shower storage space. I appreciate the rustproof materials and the shelf height adjustment features. I could also switch the razor holder from one side to the other to avoid interference with the shower control handle. Perfect fit, no rust and first-rate hardware. Expensive and worth it! The shower caddy is very well made. I'm so glad I didn't cave in to the elcheapos just for the price. It looks great in our newly remodeled bathroom and fits in beautifully with all the high-end finishes. I assembled it and had it installed within about 10 minutes. Couldn't be easier and the directions were easy to follow. The baskets are just huge. One of these would hold lots of products from an entire family! I don't know how I could be happier with this product! More expensive than the majority of shower caddies, but the quality is fantastic. Easy to assemble and fits great into the corner of a fairly small shower unit. The number of shelves make it easy to house a variety of toiletries. Looks elegant and fits perfectly in our shower. We have tried several other makes but each have rusted very quickly but this has a guarantee which makes it worth spending that little extra. We finally found a shower caddie that 1: won't rust, 2: isn't going to fall apart on you when things are put on and 3: Looks great in the bathroom. Don't end up buying cheap caddies invest in the best it will save you a hell of alot of money in the long run. Worth every penny!!!!!!! This was very pricey compared to similar shower caddies on the market but we had just had a new walk-in shower installed and didn`t want to put in any old thing.It is stylish,practical and looks brlliant.It was easy to install and has more than enough room for all my "stuff" . I love all the space for storing hair products and the fact that I can adjust the shelves to where I want them and they work best for what I use. It fit my shower perfectly without the extension piece, looks great, and appears to be very well made. Thanks Simple Human for making a product that fits my needs! The best tension caddy I have purchased so far. I have been using it for 3 months now and have not seen any build up of rust compare to the previous ones. It's elegant and with a quality aluminum pole. The shelves can accomodate enough shampoo bottles. It's a bit pricey but worth the price rather than buying cheap ones and changing them from time to time. Better than a 10 ft pole! We have 10 ft ceilings, even in the shower. Shorter, less sturdy shower caddy poles bowed in the middle and/or were not long enough. 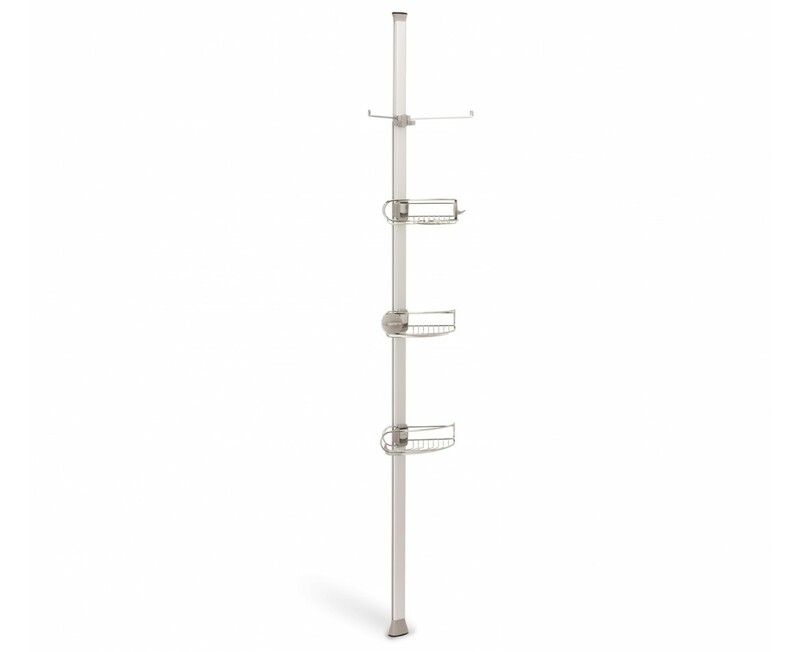 This shower caddy pole is sturdy, easy to assemble, does not bow, and looks good enough to be used in an expensive commercial spa. I am looking forward to using it for many years. it is stainless steel, good construction, very elegant as well as functional. In a small walk in shower this product maximised space and did away with clutter. Easy to assemble, a lot of storage and sleek looking too. Highly recommended. After years of hearing bumps in the night from the shower caddy falling off the wall I decided to spend a bit extra and purchase this product. It is strong, stylish and classy looking, you certainly get what you pay for, multiple baskets allow you to take everything you need in to the shower with you. A really good product. I would thoroughly reccomend it. just had an expensive bathroom refurb and wanted a tension caddy which looks the part but which also will last. very pleased with the quality and finish and theres room for everything. looks expensive and finishes off my new shower a treat. would not hesitate to purchase from simplehuman again. It does the job perfectly. A bit expensive but the build quality is very good. A good buy. Very good, very pleased with this. From the visual stand point, it looks great, from technical point, so far so good, and I have no scratches on the main pole from moving baskets, just have to be careful. This product is very easy to install and quite stable. We had five people using our shower for months as the other shower was out of order. It really helped with keeping the shower clean since the items were out of the way and off the floor. It has nice design qualities too! We adore ournew shower caddy. It has met all our needs and expectations. I was a little worried about purchasing this having had a stand alone corner caddy from the same company where the baskets kept sliding down. Having read the reviews though I thought it worth giving a go and am glad I did. The product is robust, easy to put together and the baskets manage to hold heavy weight without sliding or tipping. Makes great use of limited space and plenty of room for everything our family needs. The product was installed within 10 minutes of the box being opened and fitted easily into the corner of the shower cubicle. The adjustable shelves, which have ample space for everything needed, allow the shortest and tallest members of the family easy access to shampoo, shower gel etc. Worth spending the money to put the finishing touches to our shower cubicle. came just as described and easy to put together. takes up no space at all and is very sturdy not like the flimsy rod organizers i use to get. i love it. it's more expensive than other brands but worth every penny. the only issue i had, that another review mentioned was that not all the pieces that hold each basket are cut cleanly. One of the pieces caused a scratch as i moved it up the main rod. 2 of the other 3 pieces didn't glide on the main rod tightly, however once you snap it into place it was very secure. We've had trouble finding a rust-proof caddy that fits the high ceilings in our bathroom. We've purchased several $50 chrome caddies that rusted after about a year. This one looks good, was easy to assemble, is sturdy, and will be a great purchase if it doesn't rust. As other reviewers have mentioned, we had the problem with a clip scratching the metal pole when we slid it down. However, my husband and I are the only ones who see the scratch so it doesn't bother us. I love how easy it was to put together. It fits all of my shower items in one caddy. It looks great. I hope that it keeps its promise not to rust. I have hard water and this was an issue with my previous caddy. I have been looking for a product like this for some time. Versions of the tension shower caddy available on the UK market are much more flimsy and without the advertised rust resistance. This was the biggest draw with this product in spite of the more significantly expensive price. I justified it in the end by the fact that if every 3 years I have to throw away a rusty flimsy version of the shower caddy, then it was worth the Money. It arrived in good time. It was very easy to assemble (I did it by myself in 10 minutes), the instructions and diagram guides were clear, so the use of the extension pieces were chosen appropriately and once assembled, is very sturdy and looks good in the corner of the bathtub. It has good capacity, at present it has shampoo, conditioner, wash cloths, shower caps, bubble bath and bath wash, all comfortably in place. Now, I just have to wait to assess the rust risk as it is only 1 month old. The only issue I had, was the fact that when I first found the product, it was out of stock, I had registered to be contacted when it became available but I was not. I only realised I could purchase it when I happened to be checking the website for another unrelated reason. Poor business practice if you cannot grab every interested customer ASAP. Also the website is regularly faulty with buttons that do not function when you click on them. Thank you for your feedback. At simplehuman we pride ourselves on our high level customer service, please do contact us if you continue to experience problems with our website. We assembled the shower caddy according to directions, but as others have commented, the selves put a deep scratch (through the finish) of the main column piece. It works well, hasn't rusted yet, size and design is good. The only problem is the scratch on the finish. At this point it would be a 5 star rating except for the appearance of the scratch. I had to send this item back because I have a dropped ceiling in my bathtub/shower and the shower caddy would not fit. Before I realized this I did assemble the shower caddy and was frusturated because when I put the clips on the pole that hold the wire baskets, the clips scratched the metal pole as I slid them down. I did not see anyway to avoid this and it marred the metal. It seems like a design flaw. It also seemed a bit big for a small bathtub/shower. Other than that it was well made. Great product for holding many items needed in a shower. Provides function needed with a simple attractive appearance. A great feature is adjustable shelves. The only flaw was on one of the three shelves the welding was not finished properly which caused the shelf to scratch the vertical base when assembling. My favorite thing about the shower caddy is its simplicity. I use it everyday and don't know what I would do without it. It is very well made and my guess is that it will last a long time. It is rust proof which is great and it is very nice looking. This looks great, has a LOT of room for things and is holding up well in our highly trafficked downstairs shower. This is my 2nd shower caddy from Simple Human. It looks better than any I looked at in stores. It doesn't take up much shower space. Great find! Fitting is a bit tricky, in terms of manoeuvring it into the bathroom. Once in, it looks really good. I love this shower caddy - it works brilliantly, is well made and holds loads of stuff securely. HOWEVER, there is one major design floor, when you slide the shelves onto the pole at the start it scrapes all the silver paint off the centre of the pole. The lovely metal effect has a terrible scratch down the centre from the top to the bottom shelf. I would have expected better from a simplehuman product. Thank you for your feedback. We stand behind our products 100% and your shower caddy has a 5 year warranty. A customer service representative will be in touch to resolve the issue of the scratched pole. Easy to assemble - no srews or nails! It looks good in the shower and it looks at home! It is supposed to be rust proof and I am hoping it is. I trawled the internet for hours looking for a shower caddy that wouldn't disappoint and chose this one as the reviews from other people were consistently positive. It does indeed live up to its expectations and more. It has even impressed my husband who is always very critical of products I buy for the house as he is very practically minded and seems to know what is good quality and not. Being a family of 4 with 2 teenage daughters who like their own bottles of stuff, I am amazed that there is plenty of room for all our many bottles. The arms for hanging cloths on are also good for hanging razors on. Overall a fantastic shower caddy more than worth the money. This is our second shower caddy, and this is every bit as good as the first - and for all the same reasons that we bought the first. Excellent in every way! This is sturdy, reasonably attractive and easy to instal. The only drawback is that it was impossible not to scrape and mark the pole when fixing the shelves. This is a shame, as it means that an expensive item (for what it is) is flawed from the start. Thank you for your feedback. A customer service representative will be in touch shortly to resolve the issue with the scratched pole. I love the sturdiness of this caddy. It is spacious, it's sleek looking. The best one out there. I have in the past bought cheaper similar items and they have been fiddly to assemble and rusted quite quickly. This one was very easy to assemble, provides the facility to adjust the position of the shelves after installing and promises not to disappoint on the rust front. I am delighted with it! The service from Simple Human was also excellent.